The Yattendon and Frilsham Sports and Social Trust is a registered charity, number 300101. It owns and manages the Village Hall (also known as the Clubroom), the Recreation Ground and Car Park, and the Football Pitch in Frilsham; and the Village Hall, the Social Club, the Tennis Courts, and the Cricket Pavilion and Car Park in Yattendon. The Trust also holds a lease of the actual cricket field from Yattendon Estates Ltd. The Trust manages its assets on a day-to-day basis via a number of sub-committees, including the Frilsham Clubroom committee and the Frilsham and Yattendon Football Club committee. It also insures its assets, including public liability. An important function of the Trust is to organise the annual Yattendon and Frilsham Village Fete, which it does via a separate fete committee. The fete is an exceptional fund-raiser: this year, as last, it raised over £20,000. The fete committee distributes 15% of the proceeds to local charities of its choosing and the remainder is passed to the Trust to manage. The Trust then uses these funds to make grants to various local charitable organisations, including the Trust sub-committees, churches, schools, and other groups in Yattendon and Frilsham. 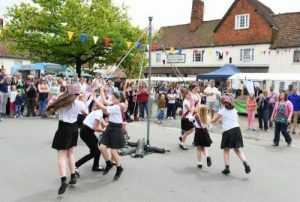 Any such group can apply for a grant – forms are available from the Trust’s chair and applications must be returned by the Sunday a week before the fete which takes place each year on the late May bank holiday Monday at the end of May. The Trust holds two public meetings each year, its AGM in April and its grant decision meeting in September. All Yattendon and Frilsham residents are welcome to come to these meetings and, in September, have their say in the grant decisions. £1,500 for the Friends of Yaendon School towards an outdoor classroom at the school.